The DISC is a low cost high gain 5 GHz CPE. We have improved antenna design, added Gigabit Ethernet port and 802.11a/n/ac support to achieve even more speed on longer distances. DISC Lite5 ac is equipped with 21 dBi dual chain antenna, 802.11a/n/ac integrated wireless, 716 MHz CPU, 256 MB RAM, 1x Gigabit Ethernet port and RouterOS Level 3 license. It comes complete with a power supply, Gigabit PoE injector and a mounting ring. The device is also compatible with our SXT mounting systems, including the quickMOUNT pro series. 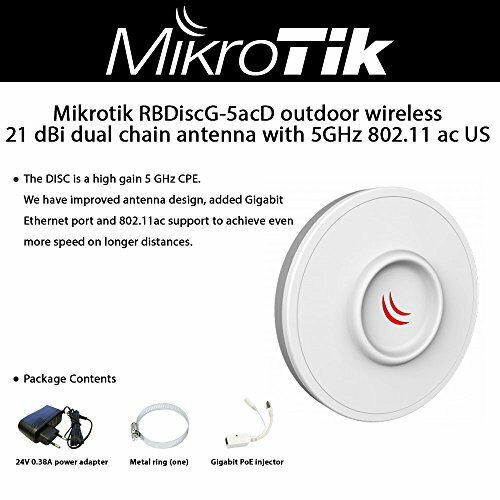 The DISC is an outdoor wireless system with a built in directional antenna ans it can be used as a CPE or for Point to Point links. DISC Lite5 ac-US (USA) is factory locked for 5170-5250MHz and 5725-5835MHz frequencies. This lock can not be removed.